WTG blade assessments are usually costly and time consuming. EWPL Ocean aggregates tasks and wind turbines in scope for blade assessment into their service train and can hereby offer this service at an attractive price, with no weather risk. The newly formed joint venture was named EWPL Ocean and will have Anders Røpke as CEO. 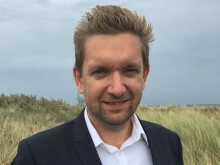 “Creating a joint venture with ESVAGT is extremely interesting and EWPL Ocean will be able to deliver a unique product portfolio that will help offshore wind farm owners and operators into a more industrialized world”, says Anders Røpke, CEO at Wind Power LAB and at EWPL Ocean. EWPL Ocean’s first service is a WTG blade assessment offshore. WTGs need regular assessments of their blades due to erosion, lightning, strikes and fatigue, but blade assessments are usually costly and time consuming. EWPL Ocean aggregates tasks and wind turbines in scope for blade assessment into their service train and can hereby offer this service at an attractive price, with no weather risk. For an agreed fixed fee, customers can have high quality images taken by drones and subsequently analysed with a best in class AI setup delivered by Wind Power LAB. “ESVAGT and Wind Power LAB have developed a unique setup where wind farm owners no longer need to worry about weather risk or logistics. Thanks to our longstanding experience and other activities in the North Sea, we are able to create synergies with our Oil & Gas business and deliver both vessels and drones, as well as absorb weather risk” says Rune Østergaard, Head of Commercial Wind at ESVAGT and Operations Director at EWPL Ocean. EWPL Ocean will continue to develop services that can help asset owners manage offshore installations from their office. This type of services will support owners in having control over their assets while outsourcing the actual work to independent expert companies that can both manage weather risk and incorporate AI solutions of the highest quality available widely into the wind industry. Søren Karas, CCO at ESVAGT, sees the co-operation with Wind Power LAB as a natural step in ESVAGT’s continued growth. “ESVAGT is the leading Service Operation Vessels (SOV) provider within offshore wind. We have a clear strategy when it comes to understanding our customers’ needs and developing new products and services on an ongoing basis that can support them in reducing LCoE. With our offshore track record, we have a series of unique competencies that can be transferred to help wind farm owners and operators within offshore wind to reduce costs and complexity”, says Søren Karas, who joined the new joint venture as board member. EWPL Ocean was launched in September 2018. The first service, the WTG Blade Assessment, will already be available this coming winter season, a time of year that is usually characterized by very limited offshore inspections due to the weather. WTG blade assessments are essential for optimising repairs, lifetime, costs and ultimate uptime for wind farms. So far, assessments have unfortunately been cumbersome, resource demanding and, in particular, dependent on the weather. EWPL Ocean makes it up through a comprehensive solution, which both simplifies the process, absorbs weather risk and offers a market leading service. Come meet EWPL Ocean and hear more about the company at WindEnergy Hamburg from September 25th to 28th. EWPL Ocean will be present at ESVAGT’s booth in Hall B4, booth 401. EWPL Ocean delivers the most advanced wind turbine blade assessment solution by taking care of weather risk and by providing independent high quality assessments. Drones capture images of the highest quality available of each wind turbine blade, which are then processed by specialized AI-technology able to detect flaws as small as 1 mm wide. EWPL Ocean then provides detailed report for documentation of wind turbine defects in a timely manner, allowing wind turbine owners to motivate data driven repair campaigns for the entire repair season. EWPL Ocean is a joint venture between ESVAGT and Wind Power LAB, and combines best-in-class skills within Sea, Safety, Logistics, Drones, AI and Blade Expertise. ESVAGT is a dedicated provider of safety and support at sea, and the leading innovative supplier of support solutions for offshore wind. Wind Power LAB delivers independent blade defect assessments with predominant precision, enabling full season repairs and data driven blade maintenance.